The August Fox Movie Channel schedule was inexplicably blank earlier this week, but happily it's now back to normal and I'm able to post some suggestions for August. Many of the titles on the schedule have been recycled from June and July, so those posts may also be useful for ideas on August viewing on Fox; simply input any of the titles discussed into the search box on the main Fox Movie Channnel website page to see if they are playing again this month. ...Two of Lloyd Nolan's Michael Shayne movies will air on August 3rd and 5th, respectively: DRESSED TO KILL (1941) and JUST OFF BROADWAY (1942). ...ON THE SUNNY SIDE (1942) is a film I don't recall turning up on Fox in the past. It stars Roddy McDowall as a British boy sent to live in the safety of America during the London Blitz. I'll definitely be recording this one on August 5th. ...McDowall turns up again in John Ford's classic HOW GREEN WAS MY VALLEY (1941) on August 7th. The movie won five Oscars, including Picture, Director, and Best Supporting Actor. ...Yul Brynner and Joanne Woodward star in Martin Ritt's THE SOUND AND THE FURY (1959) on August 9th. ...Dana Andrews and Gene Tierney of the classic LAURA (1944) were reunited with LAURA director Otto Preminger in WHERE THE SIDEWALK ENDS (1950), costarring Gary Merrill of ALL ABOUT EVE (1950). The excellent supporting cast includes Karl Malden, Craig Stevens, and character actor faves Ruth Donnelly and Tom Tully. It will be shown August 10th. ...Shirley Temple's THE BLUE BIRD (1940) airs on August 11th, followed by another film with a "bird" title, THE MUDLARK (1950). The latter film stars Irene Dunne as Queen Victoria. 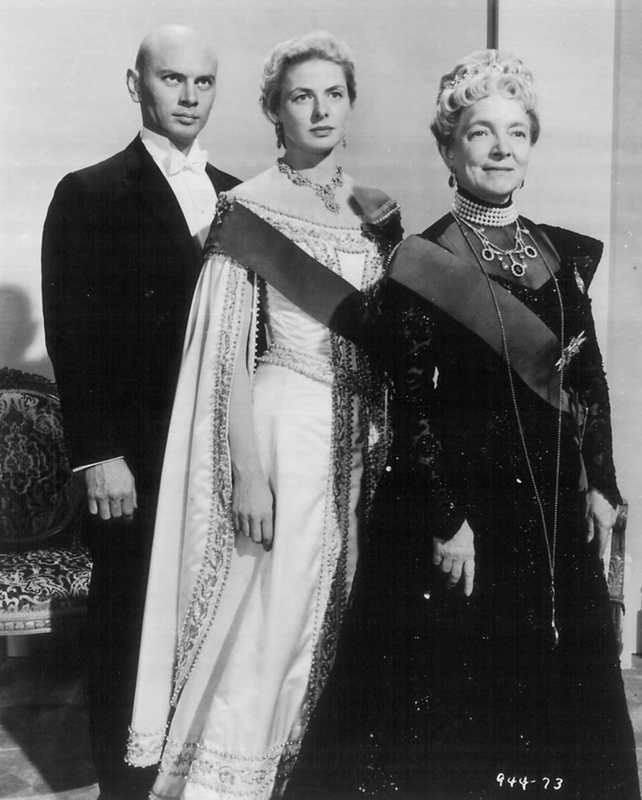 ...Also airing on August 11th: Ingrid Bergman and Yul Brynner in ANASTASIA (1956), about a woman who claims to be a surviving member of the executed Russian royal family. ...There's more Michael Shayne on August 15th, with Lloyd Nolan once again playing the detective in THE MAN WHO WOULDN'T DIE (1942). ...The Fox comedy AS YOUNG AS YOU FEEL (1951) airs on August 20th, starring Monty Woolley, Jean Peters, David Wayne, and Thelma Ritter. And what a supporting cast: Constance Bennett, Allyn Joslyn, and Marilyn Monroe! ...FIVE FINGERS (1952) is an interesting film with James Mason as a spy selling war secrets to the Nazis (! ), showing on August 21st. Danielle Darrieux and Michael Rennie costars. Darrieux, incidentally, turned 95 this year...and she was still acting as of just two years ago. ...IT SHOULDN'T HAPPEN TO A DOG (1946) joined the Fox rotation last month, and it's airing again on the 22nd. This comedy stars Allyn Joslyn, Carole Landis, and Harry Morgan. ...Gene Tierney stars in the color noir classic LEAVE HER TO HEAVEN (1945), with Jeanne Crain and Cornel Wilde in support. The color photography by Leon Shamroy must be in the top 5 or 10 most beautiful films of all time. Gene Tierney's green eyes are unforgettable. It's on August 23rd and repeats on the 27th. ...ISLAND IN THE SUN (1957) stars Joan Fontaine and James Mason, and it will be shown on August 28th. ...Dan Dailey and Joanne Dru star in THE PRIDE OF ST. LOUIS (1957) on August 30th, with Dailey playing Dizzy Dean. Richard Crenna costars. Enjoy August on Fox Movie Channel! I never heard of "On the Sunny Side" either. Sounds interesting. Thanks for the heads up. Gee, I like anything with Allyn Joslyn. Wish we had that channel around here. Glad I could pass on that tip, Kevin! I am always interested in movies related to the Blitz and even have a book on the evacuation of children from London during the war, so ON THE SUNNY SIDE sounds quite interesting. I agree, Caftan Woman, when I see Allyn Joslyn's name in the credits I always smile! He was in so many good titles and is always fun to watch. I thought it was particularly unusual seeing him as a pilot in ISLAND IN THE SKY, which was quite a change of pace from his "big city" type characters. Speaking of Allyn Joslyn, one of his best roles ever is in ONLY ANGELS HAVE WINGS (on the Jean Arthur series at UCLA you talked about after this--and one of Arthur's best too, maybe her very best). Joslyn plays one of the mail pilots and there was a great still from the movie in Susan King's L.A. Time piece from the great opening sequence with Joslyn, Arthur and Noah Beery Jr. that beautifully evokes that Hawks masterpiece.